Best known for his play R.U.R. -- (Rossum's Universal Robots). The mechanical robot (a term coined by Čapek from the Czech word "robota" meaning drudgery) opened up a whole new world of Science Fiction, as well as adding a word to the English Language. 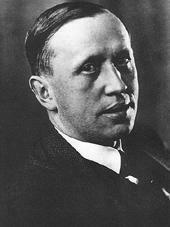 Karel Čapek is widely considered the greatest Czech author of the first half of the twentieth century. A novelist, short-story writer, playwright, and essayist, he was a strong dissident voice during the period of fascist buildup in Europe between the World Wars. He wrote a number of satires, as well as the utopian fantasy novel War with the Newts. He died in 1938.